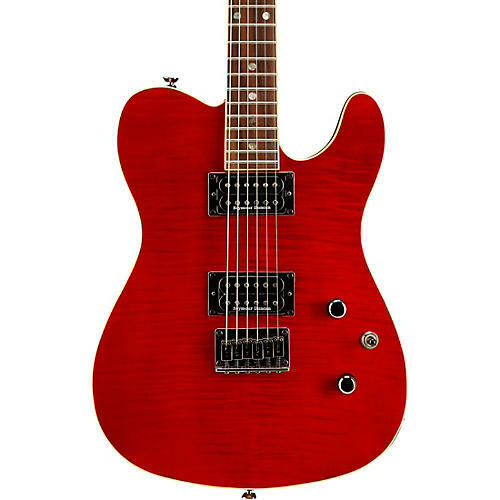 The Fender Custom Telecaster FMT Electric Guitar has tonal versatility and looks that make it welcome in any venue at a price that makes it a real Tele value. Mahogany body and set mahogany neck with rosewood fretboard and 6-saddle string-thru-body hardtail bridge provide great resonance and longer sustain. Cast sealed tuning machines keep tuning spot-on while stunning transparent finishes let the brilliance of the maple figuring shine through. Fat tones a produced by the Seymour Duncan SHPGP-1B Pearly Gates Plus bridge humbucker and Seymour Duncan SH-1N RP '59 Reverse-Polarity neck humbucker.